Displays all test cases available within the current C++ startup project, supports execution and debugging of selected test cases. 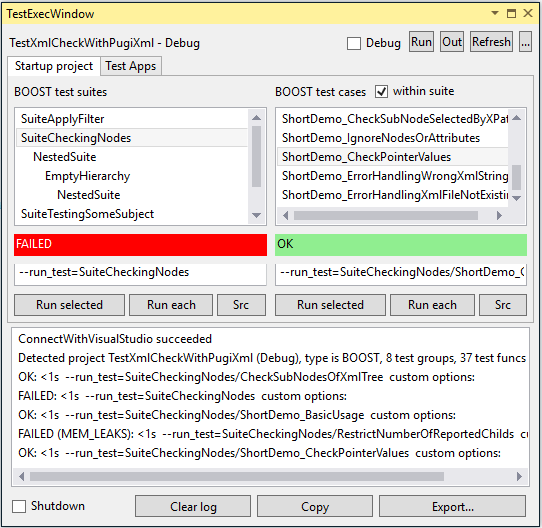 TestExecWin is a Visual Studio Extension suitable for C++ test projects based on BOOST.Test. The extension provides a tool window within Visual Studio for manipulation of unit test cases. This extension is free software (GNU GENERAL PUBLIC LICENSE Version 3). A detailed description is available within this online documentation. Every time you change the startup project within your Visual Studio solution TestExecWin will automatically check if there are any test cases to run. All found test cases are presented within the TestExecWindow and can there be selected for execution. TesetExecWin supports BOOST.Test (and proprietary TTB) testing frameworks. Depending on the framework type appropriate command params are used for executing selected test cases. The test output is written to a special tab within the Visual Studio output pane. manage simple batch files to sequentiallly execute multiple test applications of arbitrary type. optional: automatically shutdown your computer when all tests have terminated. before shutdown the results from output pane are saved to a log file for later inspection. optional: check for memory leaks.